Recently, we worked with a retail firm from the USA that sells educational products for children.The task was to extract interesting sales and behavioural patterns from the customer data. This work uncovered two important reasons why managers should move from intuitive decision making to data-driven decision making. This company makes most of its sales in December and January, as shown in the graph below. The number of units sold is so high during those two months that company managers always assumed they gave them their most important customers.In fact, they did not even give us the data from other months until we requested it. However, we wanted to validate this assumption.The graph below illustrates an interesting pattern. The y-axis is the average revenues brought in by customers after the first purchase. 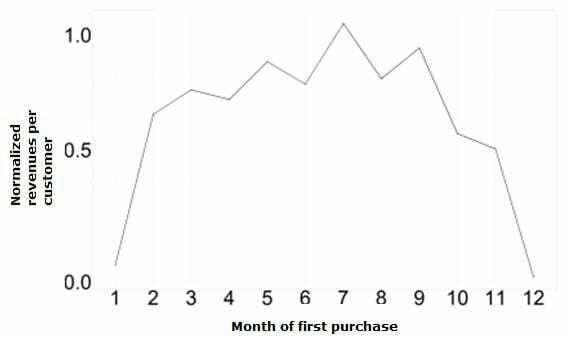 The x-axis is the month of first purchase. 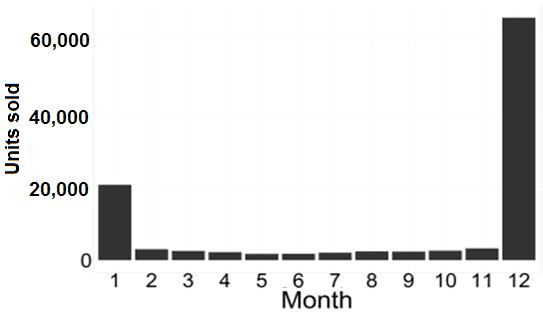 So, for example, it shows that if a customer makes the first purchase in December, she/he buys very little later. On the other hand, those who make the first purchase in July buy a lot later. Clearly, customers who bought their first product in December and January are not the best customers. Once the pattern was revealed, the sales team was full of explanations, such as, “people buy just about anything during Christmas, so of course these customers aren’t serious.”But the point is, until the data was presented in the right way, the salespeople’s intuition was being guided the wrong way. While less dramatic, the following is another interesting example of data-based decision making. The company’s salespeople assumed that more children in a family meant more money from that family to the company.This sounded reasonable, and the data supported that assumption, as shown below. 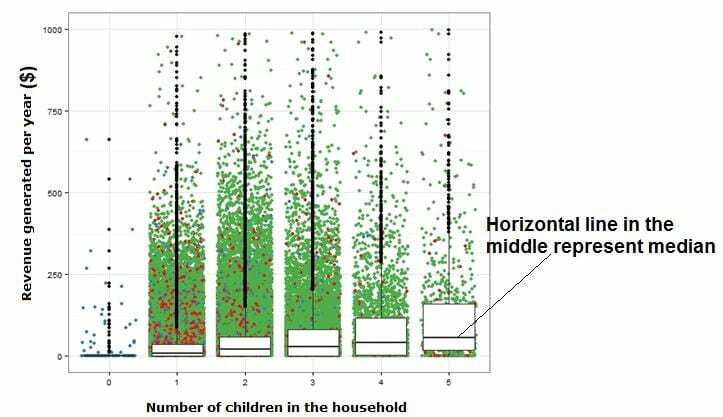 The plot below represents revenue generated as a function of the number of kids in the family. The green, red and blue dots represent revenues by customers. For this analysis, you need not worry about the colour differences or varying density of the dots for each value of X-axis. Just focus on the horizontal line in the middle of the boxes that are on top of the dots. This is the median revenue generated by that class of customers (customers with 1 kid, 2 kids etc.). As you can observe, the median increased with the number of kids. 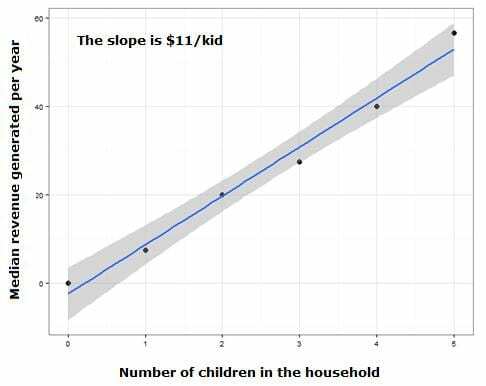 We then plotted the median as a function of the number of children in the graph below.As you can see, it fits into a perfect linear model that revealed that the average revenue per kid per year is $11. This provided a very clear thumb rule for the salespeople in estimating revenues that they can expect from customers in any given year. Such quantitative understanding enhances planning and forecasting a lot more accurate. Also Read What should one learn to be a data scientist? So, data science and mathematical modelling are here to stay and waiting for the business world to embrace it and make it part of their routines like Excel spreadsheets or PowerPoint presentations.Organizations that act fast will gain immensely. The best thing is that integrating mathematical forecasting, modelling has become really easy, thanks to some innovative technology and tools.All the above analyses were completed on approximately 200,000 customers and their families over two years of transactions.So, we are talking about millions of records.However, the tools used were all open source (i.e., free), and on normal laptops, these computations took just a few hours. So, use open source, to begin with. Have a few people in the team that can build these models. Have them explore the data. You will be surprised to see how many insights you gain that can turbo power your business. How Big is Big Data Hiring! !